Scientists have long known that Earth produces an eerie low-frequency hum that's inaudible to humans but detectable with seismic instruments. But as for what's causing this "microseismic" activity, scientists have never been sure. A new study published online Feb. 10, 2015 in the journal Geophysical Research Letters indicates that the hum is largely due to ocean waves that cause our planet to vibrate subtly -- or "ring," as the researchers put it. "We have made a big step in explaining this," Dr. Fabrice Ardhuin, a senior research scientist at the National Center for Scientific Research in Brest, France and the study's lead author, said in a written statement. "Now we know where this ringing comes from and the next question is: what can we do with it." Catching the culprit. With the help of computer models of the ocean, winds, and seafloor, the scientists were able to pinpoint the exact kind of ocean waves that cause the hum and how, Live Science reported. The researchers found that collisions between ocean waves generate some seismic activity, but it was mostly the movement and pressure of giant, slow-moving ocean waves that extend all the way down to the seafloor that cause the Earth to hum. The graphic on the left shows the computed height of giant waves that can reach the seafloor. The picture on the right shows these types of waves during a storm at a beach south of Bordeaux, France. The pressure of these long ocean waves on the seafloor generates seismic waves that cause the Earth to oscillate, scientists say. How the hum can help. The microseismic activity caused by the giant ocean waves penetrates deep into Earth’s mantle -- and possibly to its core. 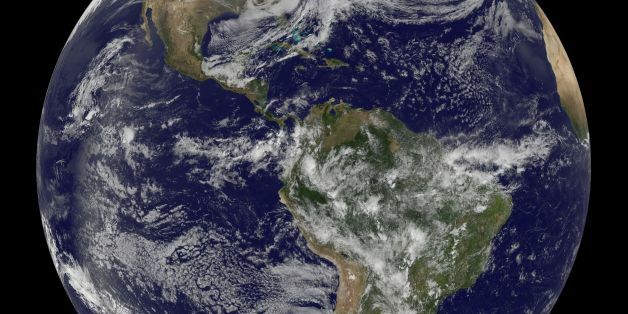 That suggests that by recording it, scientists may be able to gain a more detailed picture of our planet's interior, according to the researchers. What would the hum sound like if it were at a higher frequency -- within the range of human hearing? "If you played it at 10,000 times the speed you could hear 'white noise' like an old TV set between channels," Ardhuin told The Huffington Post in an email. Hmm. Maybe it's a good thing we can't hear the hum.